My childhood dream came true when I finally went on an African safari in 1996! I can't believe it's been almost 20 years since I was lucky to have met such esteemed wildlife conservationists as Jane Goodall and Daphne Sheldrick and view their work firsthand at their sanctuaries in East Africa. Near Sweetwater Campsite, we traveled on a small boat to view chimpanzees living in protected areas thanks to Goodall's rescue and rehabilitation work. Healthy and living wild, it was very comforting to see one successful example saving chimps in need. At our visit to Daphne's orphanage next to Nairobi National Park, we met three abandoned elephant calves only a few months old and surrounded by attentive "keepers" busy caring for them around the clock, sleeping with them in the stables and feeding them the special milk formula Daphne developed to nurse them back to health. One in particular, Emily, was my favorite, filled with curiosity and wonder as she played with us and eventually entangled her trunk in our hair! All these years later, I'm sad to say that such species are now under threat more than at anytime in history. Massive poaching, climate change and human encroachment into wildlife habitat among other factors are pushing many species over the edge directly into extinction. It is no exaggeration this decade may decide the fate of many of the world's most iconic species including chimpanzees and elephants. I can't even imagine a world without them! As a consequence, I was motivated to create a "resource guide" for the public to not only become better informed about this growing crisis but to provide effective tools to help them directly intervene and save endangered species. At first, my research revealed such horrific statistics by leading scientists and wildlife conservationists that the task seemed overwhelming to say the least. But then, I took a look around at all the work being done by all kinds of people from all walks of life from around the world, and was inspired to: finish and expand my work, join with wildlife and animal activists to continue the fight and add my contribution to help save species. There have been many tragedies such as the poaching of Satao, the beloved Kenyan tusker; the killing of Zimbabwe's tourist favorite, Cecil the Lion, for a hunting trophy no less; the extinction of the Javan rhino in recent years; and the announcement that the planet has lost about half of all species in the last four decades. But there have also been been many victories to save and protect species like never before. Jane continues to work year round spreading the good word for conservation and telling the most amazing stories about species on the verge of extinction which then make a miraculous recovery! Her reforestation projects in Tanzania work directly with the locals living side by side with the famous chimpanzees she worked with all her life. Daphne's work has evolved into an internationally recognized conservation organization, The David Sheldrick Wildlife Trust, armed with anti-poaching teams and mobile vet units working in Tsavo National Parks saving elephants and other wildlife. 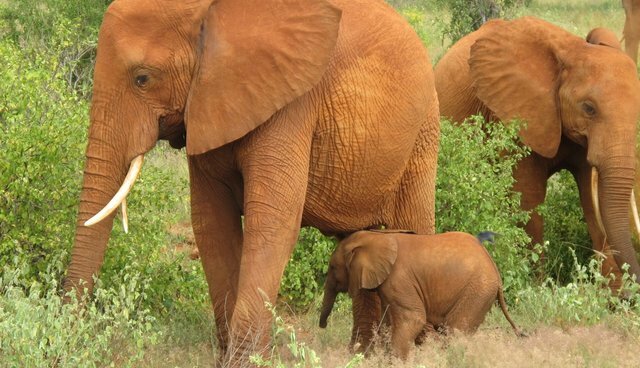 So far, their "Orphans Project" has reintroduced about 200 elephants and counting back into the wild with many more in rehab and on their way back to a healthy life in their natural habitat. Emily is grown now thanks to the Sheldricks, has two calves of her own (pictured here with Emma, her second) and lives among the wild elephant population in Tsavo, returning to the stables at Voi to give birth to her second calf and of course visit with the new orphans in rehab as well as her human friends she remembers very well! My "adulthood" dream now is to visit Emily with her own calves, living wild and free! Top photo: Emily with calf in Tsavo living wild and free. DSWT rescue from 1996.